Here starts an adventure that will span lifetimes and worlds. Discover where the story begins. Raymond E. Feist is an internationally best-selling author. My name is Pug. I was once an orphaned kitchen boy, with no family and no prospects, but I am destined to become a master magician…. War is coming to the Kingdom of the Isles from another world, bringing with it chaos and destruction. Pug yearns to train as a warrior and fight for his kingdom alongside his foster-brother, Tomas, but instead he is forced to follow a different path: a path that will lead him right into the heart of the enemy. And one that will change the course of the war - and two worlds - forever. So begins the most epic series in fantasy fiction, a tale that will cross worlds and generations. Magician is the first book in the Riftwar Saga. The trilogy continues with book two, Silverthorn. Great book. Having read the entire Riftwar Cycle, Pug is one of my favourite fictional characters of all time, but the original story is probably the strongest of the lot, except perhaps Rage of a Demon King. Arutha, Jimmy the Hand, Martin, Laurie are all great characters in their own right, and help make this books a sweeping saga that is always good to read. From the initial scenes, just hinting at what is to come, through the massive war and a couple of surprise twists near the end regarding the threats actually in play, it has a lot here but does it all very well and keeps the reader well engaged throughout. I have read this over only a few days while I was sick. Great entertaining simple fare. The morality is soap-opera like (the good ones are good, the bad ones are bad), the heroes have done slight challenges but are heroic, of course. Everything resolves in a schmalzy happy ending. If that’s your thing, then that’s what you get! What is a bit tiring is that the characters are not developed in any meaningful way. They are cardboard cut-outs of comic book heroes. The language is simple, without much poetry or wit. It’s like eating good fast food - you feel full bit youbwould not seek out the cook to give him a compliment on their cooking. 5.0 out of 5 starsFrom Start to Finish a brilliant Read. I was given this book when it first came out in paperback and bought the revised unedited authors copy when it came out in paperback now that it in ebook I just had to buy and reread again I love this book and the ones that followed you could lose yourself in the story, I have lost count how many times I have read the book and whole series over the years but it’s still as good to read today as it was almost 30 years ago. Raymond’s E. Feisty is a brilliant writer of fiction and I have loved every minute I have spent reading his books. 5.0 out of 5 starsYou will want to read this book more then once! I first read this book years ago, and although I read the entire series (fantastic!) this book I have reread many times. So of course when I bought my Kindle I had to have it in this format as well. I really don't know how to do this book justice, but if you like epic stories that have long and winding plots, where old friends pop up, then you will love this series. If you are reading this review I guess you like fantasy so you do yourself and favour and buy it! A stunning debut, which holds up well 35 years on. We have familiar territory with elves and dwarves and sorcerers, but it's told with such confidence, and with some unexpected story turns. It's a great, sweeping sword and sorcery epic: the story spans many years, expanding to cover the separate paths of about half a dozen central characters, coming of age and/or to power, witnesses or catalysts to the great events in the story. I was fascinated with fantasy fiction and Dungeons and Dragons in my youth, so I remember adding this to my "to read list" when i saw the thick spine on my school library bookshelf, all those years ago. Now, in my 30's, even more deeply-acquainted with sci-fi and fantasy genre's, I have finally made time to give this one a go. Glad I did! Suited for teen and upwards: charming and mature enough to hold an adult reader's interest, and not too dark or bloody for younger readers. 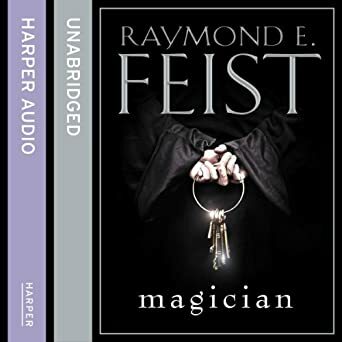 I see that Feist has expanded his world of Midkemia into a of fantasy writing career which spans 9 sagas, potentially 30 years writing, written around many of the same regions and characters first invented in this book. Not sure I'll read all his books in my lifetime -- there are so many -- but Magician is, in my opinion, worthy of the praise and attention. Magician is broad in scope and compelling in its storytelling. It doesn't break any new ground but it does the humble boy(s) coming of age and into power really well. The world building is on some ways a caricature of historical societies but it is still well done. The world(s) encompassing story is told from the perspective of several protagonists all of which are interesting in their own right - there's no desire to rush through one storyline to get to another. I have said this before, Every time I read a book I get to travel, enjoy the adventure, have a holiday from reality, meet new people and in general have a good time. I am sorry for the people that do not read, they lead such boring lives. Loved it. Hadnt read any of his books was recommended it. Im hooked on fantasy at the moment. Great characters and pace with great imagery.